Part of becoming a man of substance and resilience is learning how to care. Depth of character needs nurturing and encouragement just as much as academic or co-curricular potential. The best source of inspiration will always come from within our own local communities. Newington’s Service Learning program encourages students to consider their individual roles and responsibilities within the broader community. The program’s activities aim to enhance our boys’ awareness of the inequalities that exist within our local, national and international communities and to provide them with hands on opportunities to work alongside charity workers and community volunteers. It was was formally introduced in 2009. Our Service Learning program aims to teach our boys how to care for others. The opportunities vary from volunteering at the Exodus Loaves and Fishes kitchen, to helping fundraise for CanTeen or the Fred Hollows Foundation. Each year, we let the boys lead in initiative and action as they join their House and school community to do something for others. Each year our College experiences wonderful joys and great sadness as we are such a close community of people who care about each other. Adverse human experiences test the quality of our sense of community. Each May, boys across Year 10,11 and 12 take to the streets for the Red Shield Door Knock Appeal. It is not unusual to see many boys, staff and parents arrive at school early on a Sunday morning to show their support for the Salvation Army. Over the years Newington College has developed a strong relationship with Oasis Youth Support Network – the Salvation Army’s response to youth homelessness in Sydney’s inner city. Since 2009 Year 12 Construction boys have been busy making beds and donating them to the Oasis Surry Hills shelter. At our Prep Schools, our younger boys are expected to understand and demonstrate reliability and collaboration, face the consequences of truth and honesty and show active concern for the people and the environment of the College. As boys grow in maturity they are presented with a more formal program for demonstrating service and leadership which includes: social and personal presentation workshops; leadership programs and voluntary community outreach and service. In Year 7, boys deliver kitchen garden vegetables grown at Newington to the nearby Loaves and Fishes Restaurant which caters to those that are homeless in our local community. Some service opportunities are mandated such as the Year 8 Charity Awareness program usually held in Term 4. In this activity the boys develop an awareness campaign of their House’s charity by creating presentations using various media including Drama, Music and Computer Graphics. All boys in Years 9 and 10 organise voluntary, unpaid service work within their local community. We are mindful of the time demands already placed on our boys, so boys perform a minimum of eight hours, during either Semester 1 or 2. This service work could be performed weekly, fortnightly, or over one or two days during the holiday period. Boys can volunteer their time at a charity organisation or at a local club, church, or environmental group. These opportunities provide valuable hands on experiences for our younger boys. All Year Groups are invited to participate in a variety of charitable fundraisers throughout the year including the Salvation Army Red Shield Appeal Door Knock and Canteen’s National Bandanna Day. 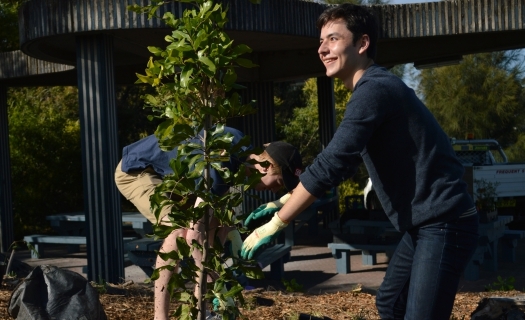 The Service Learning program plays an important role in developing leaders at the College. Our Newington graduates take the experiences learned from the program with them into the future. In the Senior School, each House takes on an area of need in the community and designs action programs. In doing so, the boys are confronted with situations that dehumanise and oppress others and are encouraged to reflect. Their reflections are invariably positive, leaving boys with a greater sense of empathy and compassion for other people in their community. Every two years, boys in Year 10 and 11 head to Nepal for a Service Learning Tour. During this tour, they learn about life in the Nepalese villages, help paint windows and walls, garden and play with the local school children. The tour is an eye-opening cultural experience. The boys are able to witness diverse value systems, rites and rituals and experience a different perspective on life and way of living. The Red Centre Immersion Tour to Central Australia is a week-long camping trip in the June-July holidays which gives boys the opportunity to learn about desert survival, try bush tucker and get a rare glimpse into the history, culture and rituals of the Aboriginal communities that reside in Central Australia. Newington has a long and close relationship with Tonga. We offer Tongan Bursaries and each year, the boys and staff visit our brother school Tupou College in Toloa, Tonga. The tour is a particularly enriching trip as it not only illustrates the history we share with Tupou College, but gives boys a better understanding of the country and people our Tonga boys belong to.